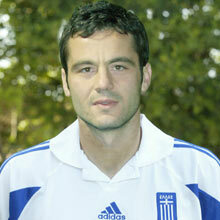 Greece Soccer Team - EURO 2004 Champions - Zisis Vryzas - by La Cancha-News On World Cup 2006 - "World's Leading Soccer Magazine!" A versatile attacking player, Zisis Vryzas can operate in an advanced midfield role or as an out-and-out striker, where he uses his aerial strength to significant effect. Vryzas first turned out for Greece in October 1994 in a home EURO '96 qualifier against Finland, a 4-0 victory. He scored his first goal three months later, in a friendly against Cyprus in Larnaca, but had to wait until Portugal for a first taste of tournament football. Was a key figure in qualifying, appearing in all but one game as the Greeks won Group 6. He scored the only goal of his side's victory in Armenia in September 2003. Joined Xanthi FC from Apollon Chrysohoriou Kavalas FC in 1991and went on to enjoy a fine spell with the Thrace team, playing in excess of 122 league matches. 1996: Opted for a move to FC PAOK Thessaloniki where he would stay for four years, scoring 19 goals in 188 league matches. Vryzas also made an impression in Europe, scoring at Highbury to eliminate Arsenal FC from the UEFA Cup in September 1997. 2000: Headed to Italy to sign for AC Perugia, making his Serie A debut against US Lecce in October 2000. Like at Xanthi and PAOK, he would play over 100 matches for Perugia. 2003/04: Played for Perugia for half a season before dropping down to Serie B to play for AC Fiorentina, who missed out on a return to the top flight. His first goals for Perugia came in a hat-trick against future employers Fiorentina.